BEIJING – China will soon complete some of its land reclamation on the Spratly islands in the disputed South China Sea, the Foreign Ministry said on Tuesday, indicating that Beijing is close to setting up new outposts in the maritime heart of Southeast Asia. The Foreign Ministry did not identify which of the seven reefs undergoing reclamation would be finished soon. China stepped up its creation of artificial islands last year, a move that has alarmed several countries in Asia and drawn growing criticism from Washington. There have been recent tensions between the Chinese navy and the U.S. military around the Spratlys. “Based on our understanding from the relevant authorities, in accordance with the set work plan, the land reclamation project for China’s construction on some islands and reefs on the Nansha islands will be completed soon,” the Foreign Ministry said in a statement, using the Chinese name for the Spratlys. U.S. officials have said the pace and scale of China’s reclamation work far outstripped that of other claimants. One official has said that before January 2014, China had only reclaimed about five hectares, but this had soared to 2,000 acres (800 hectares), expanding the acreage on outposts it occupies by over four hundred times. Recent satellite images show a hive of building and other work on the new islands. 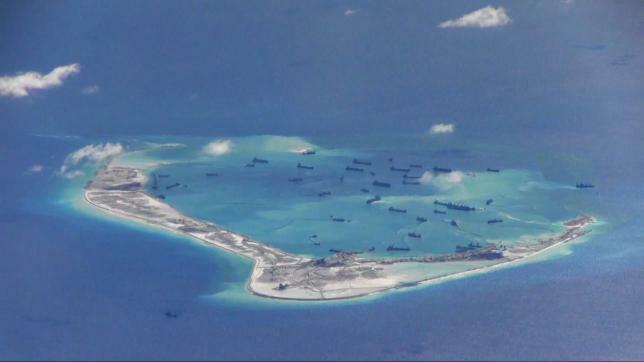 Military facilities for example are under construction on Fiery Cross Reef, including a 3,000-metre (10,000-foot) runway and airborne early warning radars, which could be operational by the year-end, according to one U.S. commander. The Foreign Ministry reiterated China’s stance that the islands would help with maritime search and rescue, disaster relief, environmental protection and offer navigational assistance as well as have undefined military purposes. After reclamation was complete, China would build facilities to “fulfill the relevant functions”, it said. The construction was within the scope of China’s sovereignty, the Foreign Ministry said, adding it would not affect freedom of navigation and overflight in the South China Sea.